Over the last year, I’ve learned to make a lot more meals and staple foods at home. I have focused on this specific area of self-improvement for a few reasons. Not only does homemade food taste better, but it reduces my family’s intake of preservatives, it’s more nutritious, and it’s often substantially cheaper than what you find in the store. It does take time to make most meals from scratch, but most people get faster with experience. Once you get used to cooking from scrach, most food preparation doesn’t take much more time than going to the store, buying it, taking it home, popping it out of the package, and following the directions. 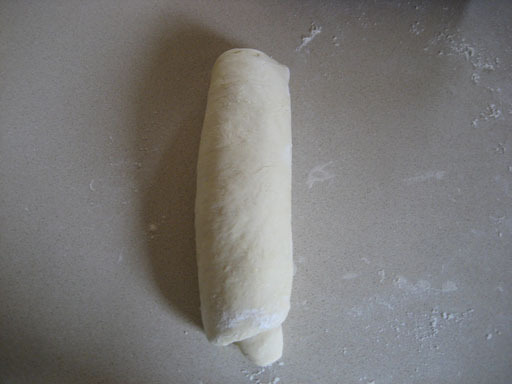 Breadmaking is a prime example of this phenomenon. 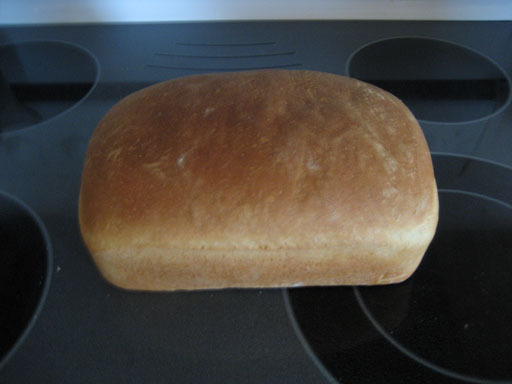 Homemade bread is substantially tastier than store-purchased bread, it isn’t laden with preservatives, it is very inexpensive to make, and it doesn’t take all that much time, either. For these reasons, I wanted to share some of my favorite recipes for homemade breads your family will love. Most people in the United States view the bread purchased at the supermarket as what bread should be. However, the reality is that the bread you can buy at the store looks and feels the way it does so it can be made on an industrial scale and last a long time without going bad. There are two big explanations for this. The industrial scale process is designed to maximize profit while still producing an edible loaf of bread you can serve at dinner. This is done by using an excessive amount of yeast in order to create lots of air bubbles in the bread, hence the “light” texture of store-purchased bread. It also allows for the use of lower-quality grains because of this yeast abundance, which means the bread is far from nutrient-rich. In the United States, most recipes are trade secrets, but in the United Kingdom, the “standard recipe” known as the Chorleywood Bread Process is widely known. The goal of this process is to make a loaf of bread as cheaply as possible, foregoing flavor, nutrition, and texture along the way. The other bothersome part of industrial breadmaking is the appearance of a healthy dose of preservatives. These preservatives are there for the sole reason of extending the shelf life of the bread, again reducing costs for the manufacturer. Every time you eat a piece of store-purchased bread, you’re getting a healthy dose of preservatives with each bite. Take a look at the ingredient list from a loaf of Home Pride butter top honey wheat bread, which is a fairly standard store-purchased loaf in my area. I put some of the ingredients in bold font for the full effect. Enriched wheat flour (flour, barley malt, ferrous sulfate (iron), “B” vitamins (niacin, thaimine mononitrate (B1), riboflavin (B2), folic acid)), water, sweetener (high fructose corn syrup or sugar), yeast, wheat bran, whole wheat flour, wheat gluten, molasses. Contains 2% or less of: soybean oil, salt, sweet dairy whey, butter (cream, salt, enzymes), maltodextrin, honey, corn syrup, calcium sulfate, soy flur, dough conditioners (may contain: dicalcium phosphate, calcium dioxide, sodium stearoyl lactylate, ethoxylated mono and diglycerides, mono and diglycerides, and/or datem), yeast nutrients (may contain: ammonium sulfate, ammonium chloride, calcium carbonate, monocalcium phosphate, and/or ammonium phosphate), cornstarch, wheat starch, vinegar, natural flavor, beta carotene (color), enzymes, calcium propionate (to retain freshness), soy lecithin. This doesn’t sound like a wholesome food we should be serving our families, does it? This sounds like a chemical-laden substance we wouldn’t serve our worst enemies. Yet, this is exactly what store-bought bread is made from. While making your own bread is easy, over time I’ve found that many people are simply intimidated by the seemingly complex and work-intensive process of making bread. If you’ve never made your own before, it may seem difficult and loaded with steps and significant work. However, this couldn’t be further from the truth. The reality is, bread is quite easy to make at home, and you only need a few staple ingredients to make a simple loaf. Here’s exactly how to make a delicious loaf at home from scratch. What you see in the picture above is every ingredient and piece of equipment that you need to make a loaf of bread (except the oven). Nothing here is complicated at all; these are very basic ingredients and tools you can get very inexpensively at your local grocery store. 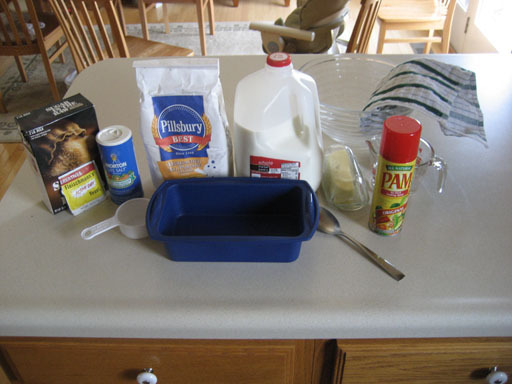 In fact, the ingredients on that table (except for the yeast) are enough to make several loaves of bread. One large mixing bowl A second one is useful, but optional – you can get by with one if you’re willing to wash it in the middle of the process. One spoon You need a spoon to stir the dough. One measuring cup A 1/4 or 1/2 cup measuring cup will do the job. One measuring spoon A one-teaspoon measurer will be just perfect. One bread pan Obviously, to bake the bread in. One hand towel This is just to cover the bread dough as it rises so it doesn’t get drafts or dust or anything on it. That’s all you need, and it’s all stuff that’s pretty common in most kitchens. That’s all you need for homemade bread, period. These items are pretty basic, so check your grocery store circular and look for online coupons (we update our coupon finder daily) to see if you can find these items on sale or discounted bulk. There are some neat things you can do with added ingredients, which I’ll talk about later, but all you need is the stuff listed above and nothing more. 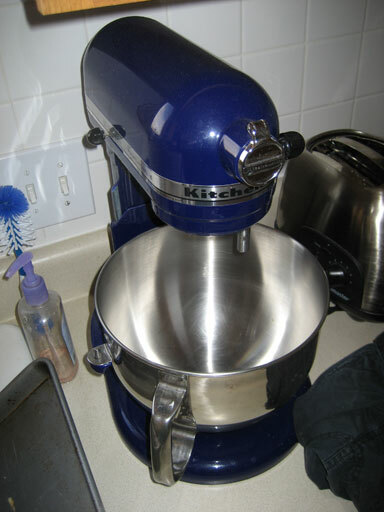 When I bake bread, I normally mix the dough with my KitchenAid stand mixer. However, making bread is easy enough that this is just a convenience and not a requirement by any means. Basically, instead of doing the kneading and stirring described below, I just flip a switch and this machine does it for me. OK, let’s get started. First, you should warm up the bowl – the best way to do that is to just fill it with hot water, then dump out the hot water, leaving the bowl rather warm. Then, mix up the yeast according to the directions on the packet. 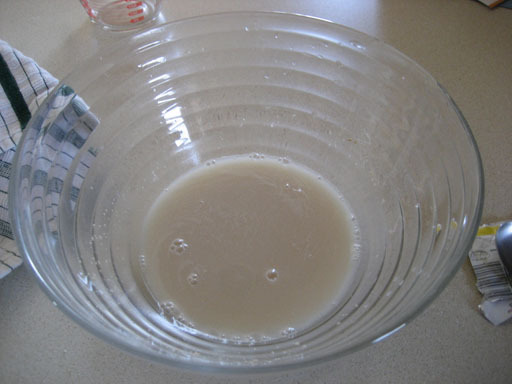 Usually, it will say something along the lines of “add a cup of warm water to the yeast and stir.” What you’ll end up with is some tan-colored water with some bubbles in it, as shown above. You should stir this until there are no lumps in the yeast. 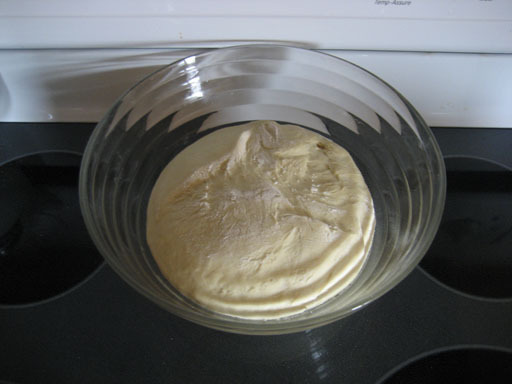 Melt the butter in the microwave, then add it, the milk, the sugar, and the salt to the yeast liquid and stir it up until everything looks the same (a very light tan liquid). 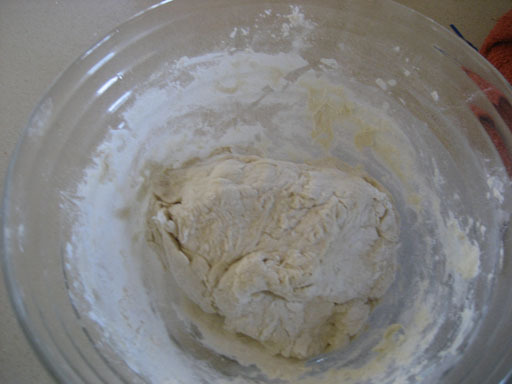 Then add two cups of flour to the mix – don’t add the rest yet. Your bowl should look something like what’s shown above, where I have the spoon on board ready to stir. Start stirring, and then add the flour about 1/4 cup at a time every minute or so. It will stick to the spoon big time at first – don’t worry about it. Keep stirring and adding flour until the dough is still slightly sticky, but it doesn’t stick to your hands in any significant way. Also, it should largely clean the sides of the bowl, leaving just a thin layer of floury stuff. It’ll look something like the above. Now comes the fun part: kneading. 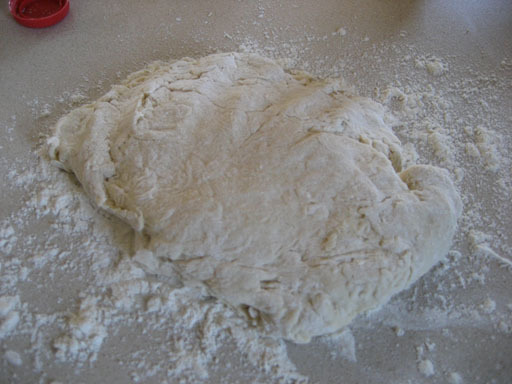 Take a bit of flour between your hands and then rub them together over the top of an area on the table where you’re going to knead the dough. Do this a few times until there’s an area on the table lightly covered in flour. 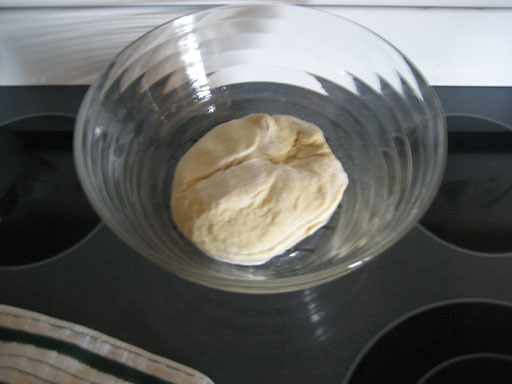 Then grab the dough ball out of the bowl, slap it down on the table, and start beating on it. Do this for ten minutes. 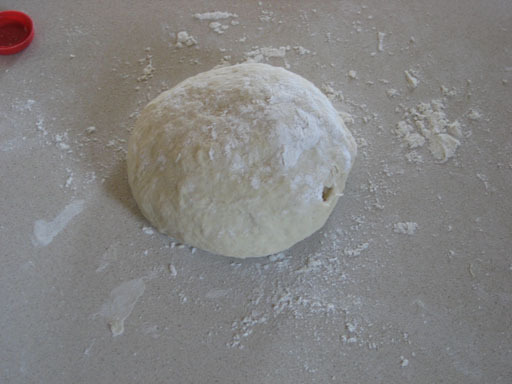 Just take the dough, punch it flat, then fold it back up into a ball again, and repeat several times. I also like to take it in my hands and squeeze and twist it. When the ten minutes are up, shape it into a ball (like shown above), then either clean up the bowl you were using before or get out another bowl. Either coat the inside lightly with corn starch or nonstick cooking spray, depending on your preference, then put the ball of dough inside the bowl. 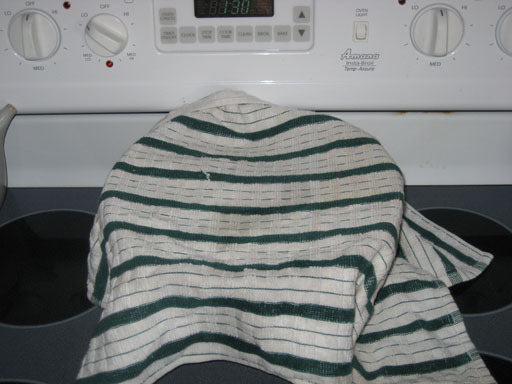 Put a cloth over the bowl and sit it somewhere fairly warm for an hour. If you have a warming area on your stove top, that’s a great place to put it – set the warming area on as low as it will go, as I’m doing in the picture above. This is a good time to clean everything else and put the stuff away, but leave the flour out and the floured area on your table untouched. It should be roughly double the size that it was before, but don’t sweat it too much if it’s larger or smaller than that, as long as it rose at least some amount. 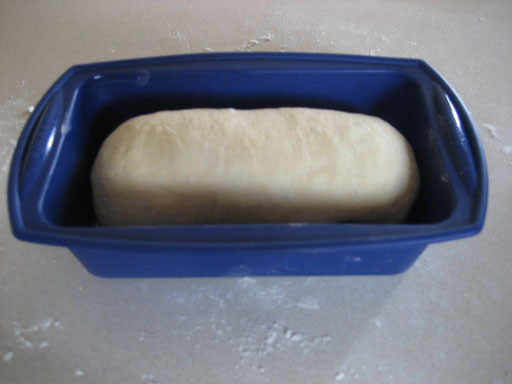 Punch the dough down (three or four good whacks will cause it to shrink back down to normal), then lay the dough out on the floured area and spread it out in a rectangle shape, with one side being roughly the length of the bread pan and the other side being about a bread pan and a half long. You may need to put a bit more flour on it and on the table to prevent sticking. Then, roll it up! 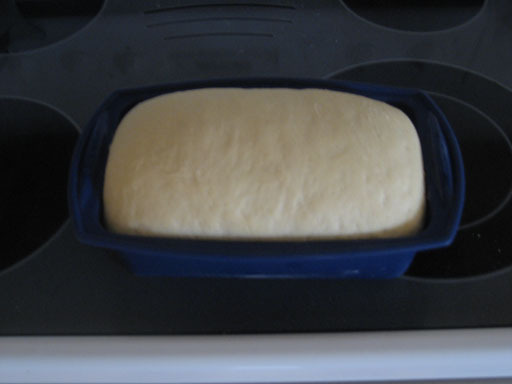 The roll should be roughly the same size as the bread pan, as shown below. Tuck the ends of the roll underneath, with the “under” side being where the seam is. Then spray the bread pan down with nonstick cooking spray (or coat it with cornmeal) and put the loaf inside of the pan. Put that loaf in the oven at 400 degrees Fahrenheit (200 degrees Celsius) for thirty minutes. When it’s done, pull it out and immediately remove it from the pan to cool. It’ll look something like this, hopefully. This bread will make mind-blowing toast. Seriously, pop a slice in the toaster, get it golden brown, and spread a bit of butter or margarine on it. Truly, truly sublime. If you get into making your own bread (and why not? It’s inexpensive, tasty, and healthy), you’ll eventually want to start experimenting. Here are some tips I’ve learned over the last year or so. Different flours work differently. If you try making a rye bread or a whole wheat bread, you’ll discover the flour has different properties. Just stick with adding it slowly to the bowl until it’s just barely not sticking to your hands, and you’ll be fine. 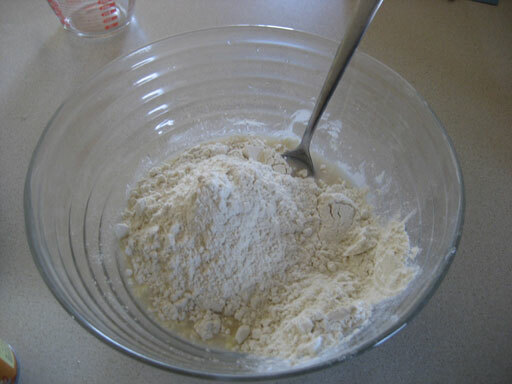 Whole wheat flour, for instance, generally requires about half a cup less flour than white flour to reach the right point. For a delicious Italian bread, replace the salt with garlic salt and before you start stirring, add in some Italian seasonings, like oregano and rosemary – or an Italian seasoning mix. You can easily double this recipe and make two loaves at once. The time investment is virtually the same and you get twice the bread. Eventually, you’ll start really experimenting. 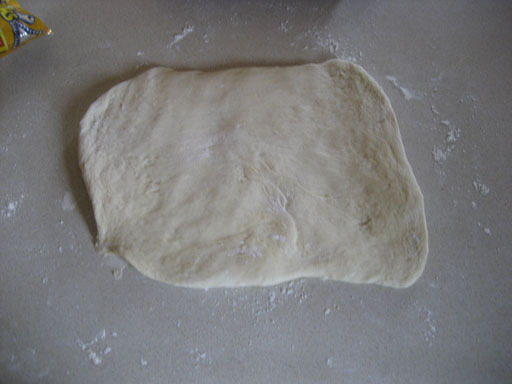 Making pizza dough from scratch is similarly easy, as are cinnamon rolls. I’ve reached the point where I feel confident making most bread recipes in the oven (except for sourdough loaves, which always seem to turn out wrong). What’s the take home? 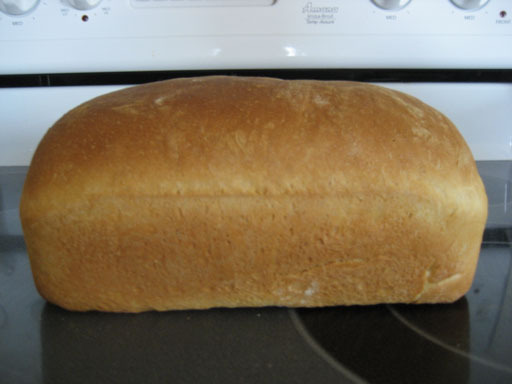 Baking homemade bread is a very worthwhile thing to try. It’s inexpensive, healthy, and teaches you a lot about how to cook at home. Best of all (for me, anyway), it makes amazingly good toast – I love to start off my day with a slice of toast made from homemade bread and a cup of tea. So, there you have it. Baking your own bread isn’t nearly as hard as people make it out to be, and I hope I proved that with the step-by-step instructions I shared above. I hope you’ll try this recipe for your own family before you buy another loaf of bread from the store. Once you start making your own bread, you’ll be hooked.